Have you ever had professional racquetball training? This fall, a new pair enter the mix. 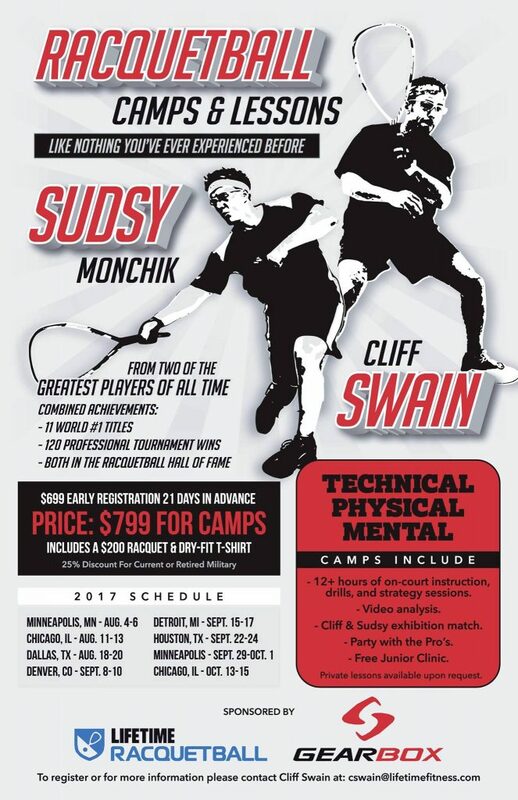 Cliff Swain and Sudsy Monchik will be putting on a series of camps at LifeTime Fitness locations in events sponsored by Gearbox Racquetball. One of the things that will be unique about the experiences with Cliff & Sudsy will be a free Juniors Clinic on Friday to start the weekend. Additional differences will be the Free $229 Gearbox premium racquet (your choice of any of the latest models) and the one year subscription to CliffSwain.com.